Photos on this site have four main characteristics to be discussed – the location, the operator, the chassis and the body. With this one, I have no problem with three of them but the last is more tricky. Firstly the location, it is the Suffolk town of Sudbury where, during the last war, the Borough Council erected a sign showing the allocation of the fifteen operators to the fourteen stands dotted around the Market Hill. The “Black Boy Hotel” in the background is little changed today but the grocery shop of E. W. King closed in November 2006 after 89 years. Their coffee was advertised on the tickets issued by Corona Coaches as shown over on “Old Bus Tickets”. Next the operator, it is William George Amos trading as J.Amos & Son, indeed I think it may be Billy himself in the driving seat. Amos was one of those rural operators who gave their full address on legal documents as simply the name of their village, in this case Belchamp St. Paul, just over the border in Essex. After all, if your depot was one side of the village green and your residence was the other side, you could be fairly certain that the postman would find you, especially if your family had been there since the 1700s. Thirdly, the chassis and if you are not totally familiar with the Bedford OB then this may not be the right web site for you. Finally we come to the body builder and this is where it gets more difficult. It is in fact Strachans and I think you can award yourself a bonus point if you knew that. The only reference where I can find to a similar combination is Roselyn Coaches (Ede) of Cornwall who had JCV 645 and KAF 992 which were fitted with a canvas sunshine roof. As Amos’ example was, I think, new to the Newquay Motor Co, I wonder if it was so fitted as well. JAF 832 lasted with Amos from 1952 to 1964, but like the operator is no more. Billy Amos made his last run to Sudbury at the age of 80 on December 31st 2002, crew operation and punch tickets remaining a feature to the end. He then got a job as a part time driver with another operator but passed away in October 2009. Nice photo of a very rare combination, Nigel. It was summer, by the look of the girl lurking under the Boots awning. Nice, also, to see the Ford 100E parked behind the coach. I suppose that Strachans made a reasonable fist of bodying the OB, but it doesn’t have the flow of the Duple version, and I’m trying hard to be objective here. What a wonderfully long career Bill Amos had. 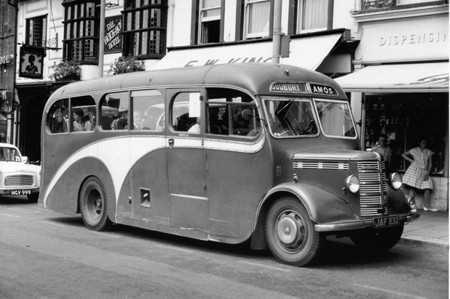 The feature of "paired" windows, with each pair having radiused corners, was very much a Strachans coach (though not bus) styling characteristic up to the early 1950s. I’m very pleased to see this posted and no, I couldn’t have awarded myself a bonus point for knowing the bodywork! Some time ago, I bought a copy of the book ‘Aspects of Buses’ by D D Gladwin, Oakwood Press and it contains a picture of this very vehicle but no details are given. When the picture of the Vic’s Tours Bedford was posted on here last year, I thought there were one or two similarities in the bodywork and I’ve wondered about the Amos one ever since. Not the same bodywork apparently but a mystery solved! The body on KAF 992 is referred in the John Woodhams book The Bedford OB & OWB as being by Mashford.